Hello! My name is Chris Roth, aka “Visio Guy”. I’ve long been fascinated with graphics and data visualization. Luckily I have had the good fortune to make a career out of that interest! I worked for the Visio Corporation for 8 years as both a developer and a technology evangelist, and now I keep busy as an independent contractor, doing largely Visio development work. As a Microsoft Visio MVP since 2002, I’ve been actively answering questions in the microsoft.public.visio newsgroups and presenting at Visio conferences. 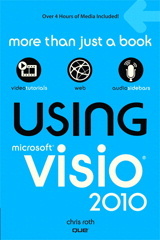 The Visio Guy website was launched in September 2006 to enable richer interaction with the Visio community. It is intended to be a valuable resource for those interested in Visio and visualization. Amongst the pages and articles you’ll find articles about creating custom SmartShapes, developing Visio-based solutions, and tips for power users. You’ll also find tools, utilities add-ons, and other free downloads for your Visio-ing pleasure. Visio Guy has been steadily gaining in popularity, and as of April, 2011, the site is happily serving up over 250,000 page views per month. In April of 2008, we added a discussion forum to relieve the over-loaded comments sections at the end of each Visio Guy article. These Visio Guy forums are also quite popular, enjoying over 200,000 views per month. I hope you find Visio Guy useful, informative and entertaining! Note: in order to get a response, please be sure that e-mail from the domain visguy.com is allowed through your filters!